Literature pertinent to the L-07D includes the instruction manuals, the service manuals, the sales brochure, the DS-20 Outer Disc Stabilizer Guide Book and the TS-10 Turntable Sheet Guide Book. All of the above referenced literature booklets are available on this page for viewing and printing. I have set the page size, such that each page should print out on a single sheet of paper on a standard printer. I have also created some documents which I have developed from the L-07D & L-07D II schematics and service manuals. These documents help me troubleshoot and repair these decks. On this page, the above referenced documents are available for display below. My opinion is that Baerwald alignment (of 16.8mm overhang) sounds better than Löfgren alignment. Baerwald alignment geometrically allows better tracking on the inner grooves. The non-damped ultra-rigid design of the L-07D tonearm mechanism works better at the inner grooves when Baerwald alignment is used. Kenwood L-07D Baerwald-Löfgren Cartridge Alignment Spreadsheet You can use the tabs at the bottom left of the spreadsheet to toggle between Baerwald and Löfgren spreadsheets. To level the platter, use an accurate circular bubble level on the subplatter. The platter sheet has a slight crown and should not be used for leveling. The bubble level in the plinth is not usually perfectly parallel to the platter. For geometry to be correct, overhang and zenith must be perfect at proper VTA. I have used a several alignment tools including a metal Denessen Soundtractor and a Turntable Basics Phono Cartridge Alignment Tool. I have also measured actual overhang beyond the spindle along the overhang line. Now I only use a custom made for the L-07D Wally Tractor. The Wally Tractor is far superior to any other method and/or device that I have tried in terms of accuracy as it is custom made exactly to the L-07D's tonearm geometry. I have reached the opinion that setting cartridge alignment with any universal cartridge alignment tool will result in imperfect cartridge alignment. For instructions on phono cartridge alignment, the reader is referred to Wally's Complete Turntable Setup Procedure which can be found on Wally Malewicz' web site: Wally's Vinyl Corner. If you order a Wally Tractor, be sure to let Wally know that the spindle diameter is 0.2825 inches. I use Wally's recommendation to set SRA at 92 degrees. First set VTA so that the headshell is parallel to the record surface at correct VTF and at correct overhang and zenith per alignment protractor. Theoretically SRA should now be at 90 degrees. Now raise the tonearm at the base by 8.59mm to increase SRA 2 degreess to 92 degrees. (1mm increase in SRA = 4.29mm increase in rear arm pivot height). Next, reset overhang and zenith with alignment protractor and reset VTF. I then set azimuth with a non magnetic level on the headshell with the stylus raised off of the LP. You can loosen the headshell collar and then slight play of the headshell allows azimuth adjustment. The slight play is gone after finger tightening the headshell collar. For setting VTF, forget about balance beam scales. They are not very inaccurate. Use a good digital stylus pressure gauge. Measurement should be taken at record surface level. All alignment parameters will affect VTF, so readjust VTF after completing platter leveling and phono cartridge alignment. When zenith is properly set, the cartridge will be rotated slightly clockwise from the long axis of the headshell (when the headshell and cartridge are viewed from above). Achieving the necessary degree of cartridge rotation to set zenith correctly is generally not a problem with the L-07D headshell if the cartridge uses full length screws and nuts for attachment. However if the cartridge has fixed threaded screw holes, the captured design of the L-07D headshell finger might not allow sufficient cartridge rotation to set zenith correctly. Therefore, with cartridges that have fixed threaded screw holes and if correct zenith can not be achieved with the original headshell, I recommend the Sumiko HS-12 headshell, which is highly adjustable. I also recommend the Sumiko HS-12 headshell as an excellent alternative to the original L-07D headshell. If you have a Sumiko Flux Buster cartridge demagnitizer, it is very handy to use to position the headshell for final tightening of cartridge attachment hardware, off the tonearm and away from the turntable. 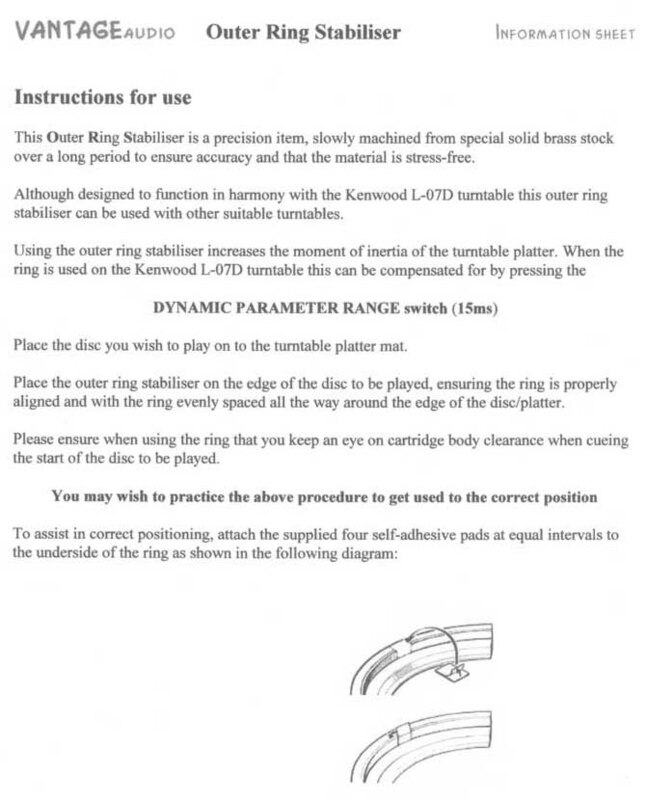 If you are using a DS-20 Outer Disk Stabilizer, pay careful attention to the tonearm cueing mechanism. It is important to prevent the stylus tip from contacting the Outer Disk Stabilizer, particularly when the platter is spinning, to prevent damage to the stylus and/or cartridge cantilever. With VTA optimally adjusted, be sure that the when the tonearm cueing mechanism is raised that the stylus tip is at least a couple of millimeters above the outer portion of the DS-20 (when DS-20 is on a record). If there is not enough clearance (and if there is room to raise the tonearm cueing mechanism cylinder further), adjust the tonearm cueing mechanism height by loosening the Allen grub screw(s) securing the cueing mechanism cylinder to tonearm collar with a 1.5mm metric Allen key. Prior to performing this procedure, the headshell should be removed and the tonearm should be removed from the tonearm base and taken over to a clean work area for this procedure. Do not put any force on the lifter support as you change the cylinder position or you may damage the cueing mechanism internally. Raising the cueing mechanism cylinder in relation to the tonearm collar will provide additional clearance between the stylus and the DS-20 Outer Disk Stabilizer. Re-tighten the Allen grub screw(s) after completing the adjustment. Please note that this procedure can only be done if there was some clearance between the screw securing the lifter support to the cueing piston and the rubber button above it when the tonearm is parked. Do not attempt this procedure if no clearance exists between the screw securing the lifter support to the cueing piston and the rubber button above it when the tonearm is parked. The difference that perfect cartridge alignment has on playback sound quality in terms of stylus tracking, channel separation and soundstaging is not small! PH 1 10 pin connecting post. Uses wire wrap posts spaced 0.10 inches apart (Standard IC connector spacing) On L-07D II round leads in white connector spaced 0.10 inch apart. PH 3 11 pin connecting post. Uses wire wrap posts spaced 0.10 inches apart (Standard IC connector spacing) On L-07D II round leads in white connector spaced 0.10 inch apart. D2 1N60 diode, max. forward voltage drop is 1 volt at 200ma. Beware of factory defect PCB that is missing R4!!! Unit will intermittently not quartz lock at 33 RPM! Note: Hall elements used in the motor are SMD's (Surface Mount Devices). A low-voltage soldering station with a very fine-tip iron, and magnification, are recommended for Hall element replacement work. Trim Hall element leads to length of original before soldering. This task requires advanced soldering skills. During start and stop, both coils are energized together. Once quartz lock is attained, the coils only get energized alternatively; i.e. coil A on, B off and vice-versa. This ensures a smoother motor operation as now the rotational energization is passed on from one star tip to the next in succession. Kenwood L-07D Logic PCB IC Continuity List. This table lists the next point in the continuity chain for each IC pin. Use this list to check for open circuits before/after IC replacement. Also use to check any IC’s previously replaced. For resistors and capacitors, a continuity tester will read continuity on only one side of the resistor or capacitor. If a continuity tester reads open circuit on both sides of the resistor or capacitor, that would indicate a fault (open circuit). Always check adjacent pins on IC’s for shorts due to soldering. I prefer to use sockets when replacing IC’s. I prefer low profile IC sockets. On a good board, the solder will flow through from bottom to top and catch the top trace. Use flux on both top and bottom traces. Solder wick works best for de-soldering. This list was made based upon schematics in the service manual and large schematic, and verified with continuity tester testing on a properly working PCB. Inside the X25-1550-00 Connector PCB receptacle, the 24 pins are defined in four rows labeled A through C and six columns labeled 1 through 6. Unit starts without pushing operation button, speed indicator momentarily hits GREEN but continues to speed up and stays RED, pushing operation button does not stop unit – Bad IC2. Solenoid clicks when powered up at 33 rpm before operation button is pushed. If operation button is pushed (at 33 rpm) unit will quartz lock. If operation button is pushed again, unit will stop and solenoid will resume clicking once platter stops. If switched to 45 rpm, unit will turn backwards and will not stop when operation button is pressed again. - Bad IC 2. Unit starts but speed indicator never turns GREEN, platter over-speeds. Operation button slows platter with much less force than normal - Bad IC 2. Unit starts and quartz locks normally at 33 and 45 rpm. When operation button is pushed mechanical brake chatters (Solenoid clicking) and works ineffectively. Mechanical brake chatter stops when platter stops. - Bad IC 2. Unit powers on normally with platter motionless before operation button is pushed. Engagement of solenoid brake occurs almost silently at power-up, without the usual audible click. Unit will quartz lock when operation button is pushed. When operation button is pushed again, platter will slow to a stop and then continue to rock back and forth, brake solenoid doesn't deploy. Pushing operation button again, unit will play and quartz lock, but same phenomenon when the operation button is pushed again; platter will slow to a stop and then continue to rock back and forth, brake solenoid doesn't deploy - Bad IC 3. Speed indicator flashes RED-GREEN, runs at correct speed but won’t quartz lock – Bad IC 6. When the Operation button is pushed, the platter gradually increases speed but over-speeds. Speed indicator doesn’t turn GREEN. Pushing the Operation button again results in platter stopping a few minutes later (Mechanical brake correctly activates with click sound and platter stops) - Bad IC 7. Motor buzzing when platter is stopped due to electronic brake remaining on - Bad Q23. Platter gently rocks back and forth at startup, but will not spin. If started with a push, it will spin but will not quartz lock - bad C102. Speed indicator flashes RED-GREEN and depending on the position of the rotor platter will start alone or just rock backward and forward - bad C119 allowing DC on the B winding. Unit goes to hyper-speed, speed indicator never flashes GREEN. Brake works properly – Bad L1 and L2 inductors on X25-1550-00 Connector PCB. Unit occasionally won't quartz lock at 33 rpm - Check for factory defect in X25-1550-00 Connector PCB. I have found one made without R4. Unit starts and plays normally. Only problem is clattering sound from motor during electronic braking. Braking function is otherwise normal. - Bad capacitors on X25-1550-00 Connector PCB. Replace 0.1uf Ceramic capacitors (2), replace and upgrade 10uf electrolytic capacitors (4). Unit starts and plays normally. Only problem is mechanical brake engages as soon as Operation button is pushed to stop platter rotation. Braking function is otherwise normal including electronic braking. (Mechanical brake is not supposed to engage until electronic brake has slowed platter to 1/5 of operating speed,) – Bad IC 2. Platter over-speeds momentarily for about 1/2 turn (kick) before it returns to lock mode. This happens every 10-15 sec.– Bad front Hall element. Poor start-up torque – Bad rear Hall element. Rubbing sound in motor - Possibility #1: Magnetic pad has de-laminated from underside of rotor. Do not run unit until repairs are made. Possibility #2: Thrust bushing wear has allowed rotor to rub mag-lev PCB. Repair by disassembling thrust bushing mechanism. Flip bushing over to expose unworn side and reassemble with a new O-ring and lubricate bearing. Do not run unit until repairs are made. When the unit is powered up, both speed indicators (33 & 45 RPM) are on at same time (RED) instead of one. When the speed button is pressed, 33 RPM speed indicator turns off, 45 RPM speed indicator remains on (RED), press the speed button once again and 33 & 45 RPM are again on at same time (RED). (45 RPM speed indicator never turns off.) Unit will only play at 33RPM, either with speed indicator reading 45 RPM quartz lock (GREEN) but actual speed is 33 RPM, or if speed button is pushed will again quartz lock at 33 RPM with both speed indicator LEDs staying on at the same time (33 & 45 RPM speed indicators both (GREEN). (45 RPM speed indicator never turns off.) – Bad IC 301 and 302 on switching PCB. PLL waveform not stable, noise in AC signal driving the motor - Bad 0.001 uf capacitor. The author reserves the right not to be responsible for the topicality, correctness, completeness or quality of the information provided. Liability claims regarding damage caused by the use of any information provided, including any kind of information which is incomplete or incorrect, will therefore be rejected. All offers are not-binding and without obligation. Parts of the pages or the complete publication including all offers and information might be extended, changed or partly or completely deleted by the author without separate announcement. This site provides no warranty, expressed or implied, as to the accuracy, reliability or completeness of furnished data. This disclaimer applies to all portions, pages, images and text applicable to this entire website. If the opportunity for the input of personal or business data (e-mail addresses, name, addresses) is given, the input of these data takes place voluntarily. The use and payment of all offered services are permitted - if and so far technically possible and reasonable - without specification of any personal data or under specification of anonymous data or an alias. The use of published postal addresses, telephone or fax numbers and e-mail addresses for marketing purposes is prohibited, offenders sending unwanted spam messages will be punished.